The Science Museum is a seven floor giant’s toy box. Children of every age stand in awe at the exhibits whose subjects cover art, energy, environment, medicine, biology, space and transport. Entry is through the Energy Hall on the ground floor which has full size rockets, satellites and airplanes on the roof and cars on the walls. The first steam engine, Stephenson’s Rocket, stands on the floor amongst other exhibits and a giant building height pendulum demonstrates the rotation of the earth. The exhibits are educational and many are interactive – there are plenty of buttons to push, levers to pull with sometimes explosive effects. . The whole experience is awe inspiring and exhilarating. The museum was founded in 1909 from the Science Collection of the South Kensington Museum when the Art Museum was moved to the new Victoria and Albert Museum. The nucleus of the collection was formed in 1857 and included surplus items from the Great Exhibition of that year and material from the Royal Society of Arts. The current building was opened to the public in stages between 1918 and 1928 and was intended to be the first building of a larger project which was never realised. The exterior of the building is modelled on an Edwardian office building and the interior on a department store. The roof lit central well is ideal for the display of large engines, and there are open galleries to the sides. A new wing has recently been completed and includes an IMAX cinema. The museum holds more than 300,000 items including the Gipsy Moth in which Amy Johnson flew to Australia in 1930, Alcock and Brown’s Vickers-Vimy (1919) which was the first aircraft to cross the Atlantic non-stop, a Benz three-wheeler motor car of 1888, a 1904 Rolls Royce, Foucault’s Pendulum the movementof which demonstrates the earth’s rotation, a reconstruction of Francis Crick and James Watson’s model of DNA, some of the earliest surviving steam engines, Edison’s original phonograph and Whittle’s first jet propulsion engine. 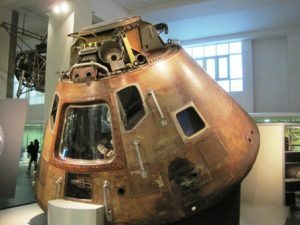 Among the best of the museum’s must see exhibits are: the Apollo 10 Command Module; a working model of Charles Babbages’s Difference Engine which was the first proposal for a computer; Puffing Billy, the oldest surviving steam locomotive built in 1815 and Stephensons Rocket which won the Rainhill Trials of 1829. First Floor: Agriculture; Challenge of Materials; Cosmos & Culture; Listening Post; Measuring Time; Plasticity; Telecommunications; Who Am I? 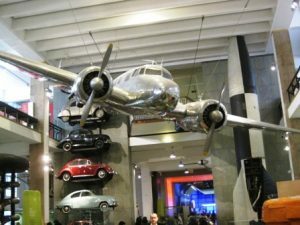 The Science Museum is open every day (except 24-26 December) and entry is free. Charges may apply to the Imax Cinema, flight simulators and some special exhibitions. The Science Museum often opens an hour later in school holidays.